The workhorse for dry fertilizer strip-tilling has been, and remains, the Montag Generation One dry fertilizer unit. 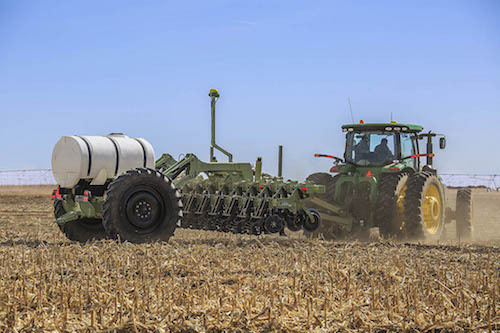 This workhorse offers savings on fertilizer costs through greater fertilizer efficiency by accurately placing dry fertilizer in an underground concentrated band, which is readily available to the crop roots. 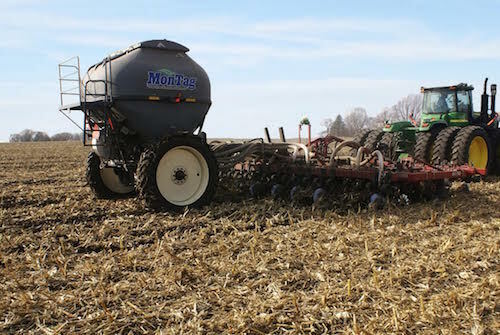 By strip-tilling with a Montag Gen I unit, crop yields can be increased, and since the fertilizer is in the root zone, greater efficiency can be achieved. Gen I’s unique, very accurate design is available in different sizes, row numbers and output capacities for easy adopting into your strip-tilling operation. 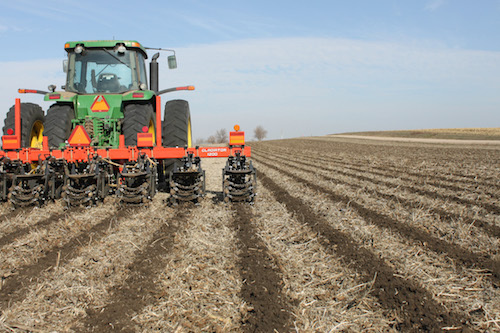 Strip-tilling and a Montag unit — they just go together. The Gladiator Strip Tillage System offers on-row conservation tillage, precise nutrient placement and nonstop seedbed conditioning while reducing adjustment and maintenance time from field to field for maximum profitability. The innovative fixed frame toolbar and ST-PRO™ row units contour to ground surface conditions, allowing the shanks to consistently operate at the customer-determined depth. More than just strip-till, this is precision nutrient and seedbed management. 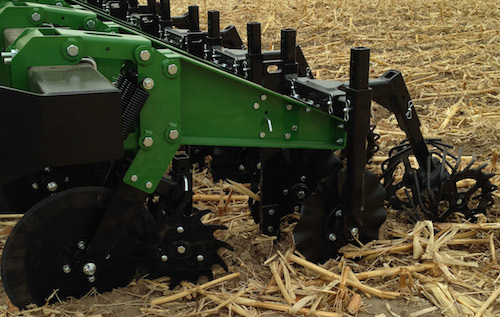 The Gladiator Strip Tillage System is available in 3-point and pull-type models with working widths from 15-40 feet. 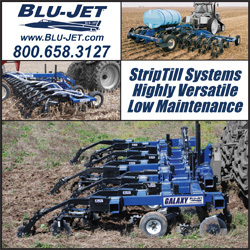 The Blu-Jet StripTill Systems break the limitations of other strip-till implements by offering row unit components that work individually with the soil, residue and obstacles, to maximize performance while also reducing the maintenance requirements compared to most competitive units. With the ability to apply dry, liquid or dual-placement fertilizer solutions in numerous possible configurations, these award-winning components fit any operation. For nearly 45 years, Blu-Jet has been an innovative leader in fertilizer injection and tillage equipment, backed by a 5-year frame warranty for years of dependable service. RadialRazor™ is an outstanding coulter for planting and seeding in conservation tillage practices. With its patented edge design, the gradual rise and return of the wave edge pattern sharply cuts through residue, not forcing it into the seed slot. 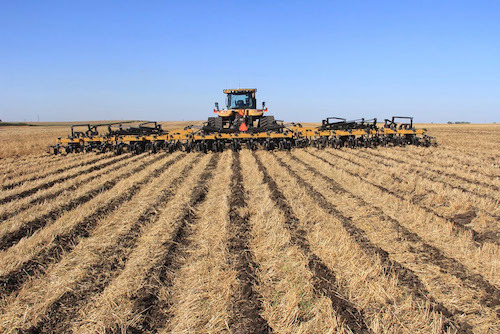 It creates an ideal no-till seedbed by making a consistent, narrow-planting slot that becomes an optimum seed environment and allows for uniform seed placement. The patented design helps maintain trench moisture with less soil disturbance outside the furrow. Experience faster planting and seeding with reduced sidewall smearing and compaction. Versatile application makes it effective in wet or dry soils. 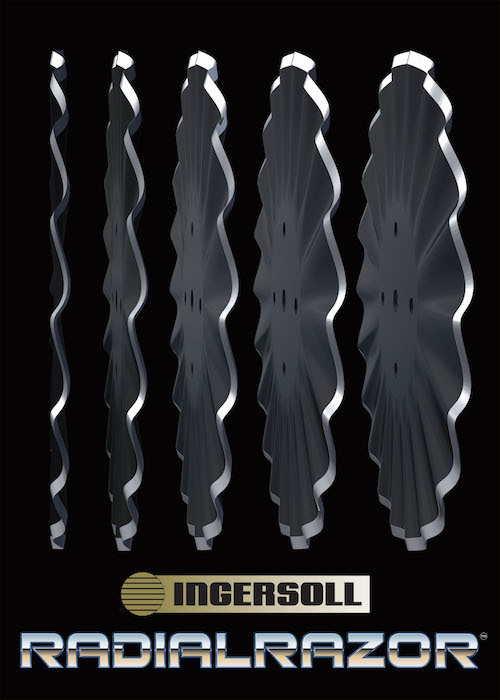 The RadialRazor is constructed of Ingersoll strong steel. Coulters are amazingly hard, yet flexible — constructed with Ingersoll’s proprietary boron alloy steel. Lower horsepower needed for vertical penetration. Click here for more information or call toll free at 888-768-1740. Land Luvr designs and manufactures strip-till row units and toolbars for a variety of applications. Integra Frame heavy-duty tool bars range from the rugged 60-foot large capacity frame to a single row, 3-point mount. These toolbars boast a narrow transport width and a wide base frame and wing brace system. Steerable axles are also an option. The heavy-duty R-Series strip-till units are available in three base models with many optional components allowing for a customized unit. The shank design allows it to move soil efficiently, requiring less horsepower, and uses rack and pinion to adjust working depth. 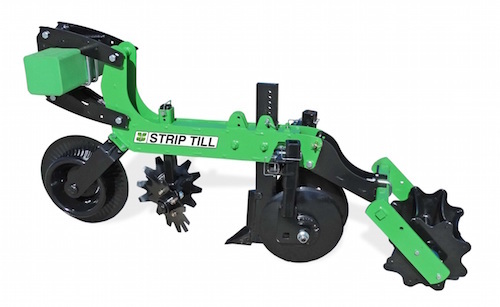 Yetter’s 2984 Strip Freshener utilizes a 3-blade design followed with the rolling basket to condition existing strips to warm the planting zone or create spring strips. The parallel linkage arms allow the freshener to follow the field contour at operating speeds of 6 to 10 mph and 2 to 4 inches deep. The Strip Freshener includes a universal mounting bracket to fit 4-by-4-inch, 5-by-7-inch, 6-by-6-inch, and 7-by-7-inch toolbars. Optional fertilizer kit for liquid or dry application is available. 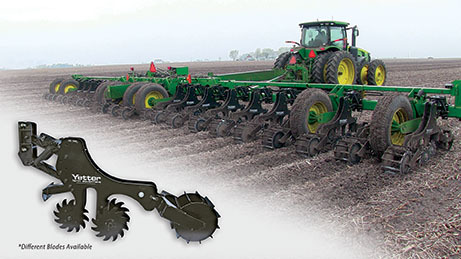 Precise tillage, seedbed preparation and fertilizer application—all in a single pass. 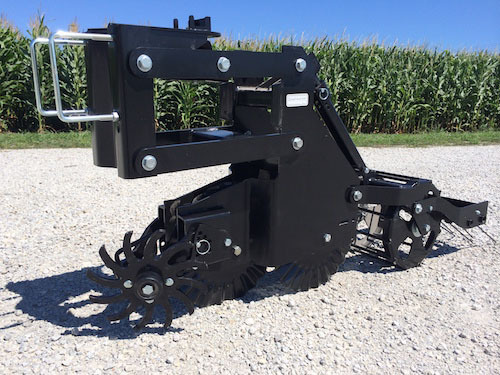 Available in configurations from 4 to 24 rows and with a wide variety of ripper shanks and closing tools, Bigham’s Strip Till is the most customizable in the industry. Tab and slot construction, triple-sealed bearings made in the U.S., AR400 steel components and a rugged, simple design deliver unmatched durability and strength. Baskets, shanks and discs now utilize the easy pin-adjust system — no tools required! Go custom, go quality, go service — go Bigham Ag. The ZoneMaster is a strip-till tool designed to create optimal spring strips or to dress up fall-applied strips. The ZoneMaster clears residue, lightly conditions the soil, causes faster warm-up and dry-down, with faster and more even germination. Using “vertical tillage,” it creates an optimal planting atmosphere. ZoneMaster can also be used to apply starter fertilizer or liquid fertilizer in the root zone. ZoneMaster provides the best in quality and value to serve the purpose of creating a better yield via pre-planting preparation and soil condition optimization. The ZoneMaster is field-tested and proven. The Big Country RZM (Root Zone Manager) system from Wako is designed to increase bushels in all soil types by creating an adjustable box of worked soil from 6-8 inches. The box or zone allows better seedbed conditions for planting, resulting in roots that go deeper quicker to capture vital nutrients and moisture. This three-coulter system sizes the soil, reduces air pockets, improves moisture intake and places nutrients where they are needed. It’s available in 12-, 16-, 18- and 24-row widths. Click here for more information or call 800-299-4300. Precision seedbeds in a single pass; no wonder the Orthman 1tRIPr is the most popular strip-till system on earth! The 1tRIPr provides a clean, level, seed-ready seedbed in a variety of field conditions, including wheat stubble, cover crops, standing Bt corn stalks and many more. 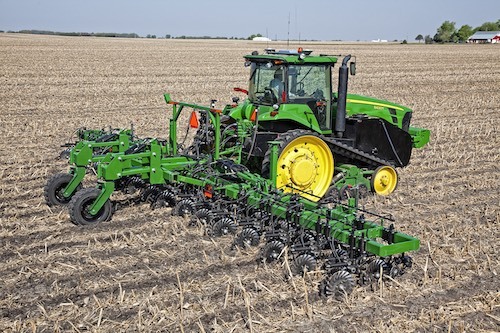 With unprecedented flexibility to customize seedbed preparation, the 1tRIPr is available in 4- to 24-row configurations with 22- to 40-inch spacing using Orthman’s time-tested rigid or folding toolbars. To maximize one-pass productivity, the 1tRIPr can be utilized alone or in unison with one of the many fertilizer-carrying options Orthman has to offer. And the new pull-type 1tRIPr XD keeps Orthman out in front with precision tillage solutions for big operations. With configurations up to 18 rows and a full range of high-capacity dry and liquid fertilizer-carrying capabilities, the Orthman 1tRIPr XD is the leader in high-efficiency precision tillage. Perfect for spring or fall, whether running in wheat straw, soybean stubble or standing cornstalks, the Dawn Pluribus strip-till unit is the right tool for the job. Apply any combination of liquid or dry fertilizers and stay well ahead of your planter by running up to 10 mph, with as little as 10 horsepower per row. Plant into a clean, warm, dry, almost conventional-like strip, yet leave all residue on the surface. Make money instead of tying up nitrogen. With less fuel, time, fertilizer, equipment and moisture loss, it all adds up to more profit in your pocket.